In celebration of the televeision network's 60'th anniversary, the Himig Handog had been relaunched which gives talented song writers on stage. This year's competition was joined by a total of 2,500 all original compositions from Filipino song writers worldwide. Below is the complete list of the twelve finalists. "Himig Handog P-Pop Love Songs" grand finals night will be held on February 24 (Sunday) at the Mall Of Asia Arena in Pasay City and will be aired live on no other else but ABS-CBN Channel 2. 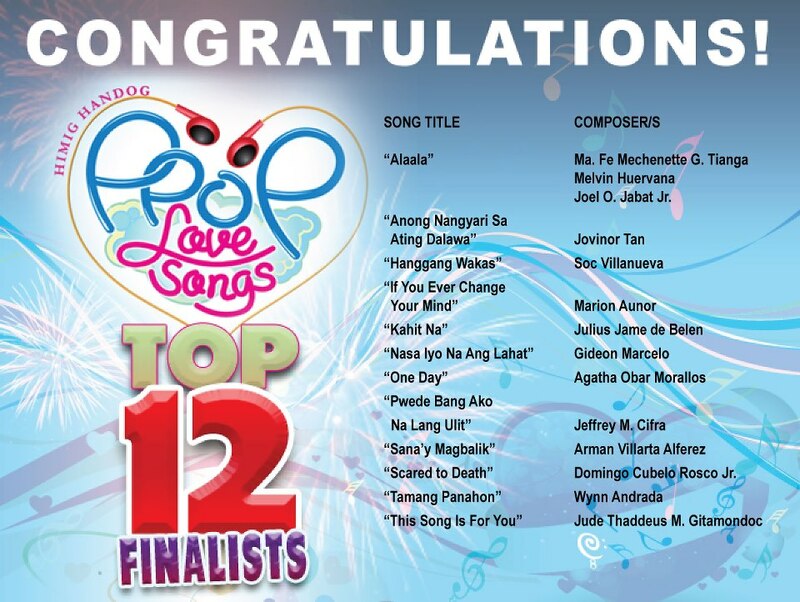 The finalist songs were sang by some biggest names in Philippine music indsutry namely Angeline Quinto who interpreted the song "One Day," Aiza Seguerra for "Anong Nangyari Sa Ating Dalawa," Erik Santos for "This Song's For You," Yeng Constantino for "Alaala," Juris for "Hanggang Wakas," Toni Gonzaga for "Kahit Na," Bugoy Drilon for "Pwede Bang Ako Na Lang Ulit," Jovit Baldivino for "Sana'y Magbalik," KZ Tandingan for "Scared To Death," and Daniel Padilla for the song "Nasa Iyo Na Ang Lahat." This season's competition was hosted by Xian Lim, Kim Chiu, Matteo Guidicelli, and Megan Young. February 25, 2013 Declared A Holiday! Sharon Cuneta Wants To Go Back On ABS-CBN? Why Is Philippine Peso So Strong Against USD?